This appears to be a French Club national du disque issue of a Musical Masterpiece Society recording, with the influential Czech-born Viennese conductor and teacher Henry Swoboda conducting the Netherlands Philharmonic (on the MMS, see David Patmore, 'Your room a Concert Hall', Classic Record Collector, Vo.6 No.23, Winter 2000, pp.38-42). According to the Bibliothèque nationale's catalogue, dépôt légal of the MMS issue was in 1955, so I've taken a punt on that as recording date. Interestingly, after the amusing balls-up I related in my previous post, I found that this 10-inch LP has its labels reversed - or, rather, the labels themselves aren't (side and matrix numbers are consistent with the very extensive markings in the run-off area) but the title listings on them are, with Symphony No.94 billed as No.100 and vice versa. 8 mono FLACs in a .rar file here. Yes, I know, there's hum and rumble - they don't bother me too much but if you want to take them out and repost the results, please feel free! Better still, teach me how to do it... Otherwise, I found the sound rather good and needing only declicking (apart from the very end of No.100, which gets a bit harsh and crackly). Back to Poitiers: I recently spent a delightful if drizzly Saturday enjoying its commanding site on a limestone ridge, exploring the lovely streets, squares, old merchants' houses and modern shops. When I asked in a musical instrument shop if anyone sold classical LPs, they said no, Poitiers is more rock and country! But, hurrah, later, conveniently after the sight-seeing, I stumbled on a charity shop with a few crates of LPs and 78s. If you've never seen the facade of Notre-Dame-la-Grande, go: it's stunning and has been rightly compared to a mediaeval ivory panel (the neighbouring food market is predictably mouth-watering). The inside is thoroughly Viollet-le-Duc-ized but none the less atmospheric (and damp) for that. But I preferred the more austere cathédrale de Saint-Pierre et Saint-Paul, with its amazing 12th C stained-glass window, 13th C carved choir stalls and, best of all, barely altered 1790 organ, the last work of François-Henri Clicquot, who died during the construction, completed by his son Claude-François. 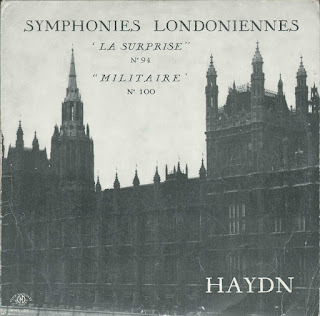 I would love to hear this last flowering of 18th C French organ-building - and I would love to go back, with more transport, to the shop where I found this LP and a shedload of ancient vertical cut Pathé 78s! I could only carry a few so I took two, and I already regret leaving the 10-inch lateral cut Pathé (X9918) of cellist Marguerite Caponsacchi - but she was only playing arrangements of Schumann and Schubert.